Many homeowners and business ownersunderestimate the danger of mold. Many types of mold are hazardous to your health and can damage the structure of your building, especially black mold which is often found in bathrooms and basements. Mold grows indoors on wet or damp surfaces such as carpets, ceiling tiles, wallpaper, insulation material, wood and drywall. 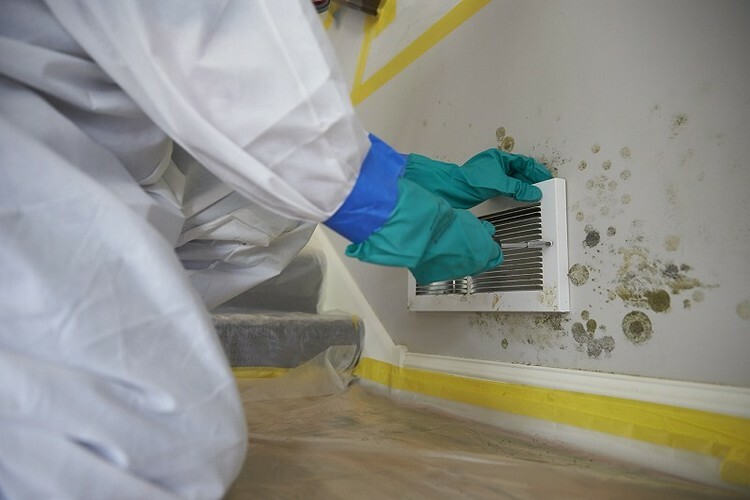 Mold can start to grow within 48 hours after flooding or other water damage, and if not removed in a professional and timely manner, can have serious impact on personal health and cause damage to your property’s physical structure. If you notice the presence of mold in your home or business, contact the industry leading mold removal experts, ServiceMaster of Midland/Orillia. We are here to help remove mold and prevent potential health risks and long-term damage to your property. Mold growth can occur following water damage or flooding. Fast, efficient action is essential for effective mold removal, and especially in the case of black mold. By eliminating the water source and implementing rapid drying, ServiceMaster of Midland/Orilliacan put a stop to toxic mold growth in your home or business. With 65 years of experience andexpertise, our company is a leader inthe mold removal and mold remediation industry, with highly trained technicians and the professional-grade techniques, products and equipment necessary for proper and effective mold removal. We assess each situation and establish the most effective mold removal procedures to meet the needs of your particular home or business property. Because mold can start growing within 48 hours, it's important to respond quickly to flooding and other water damage. We use professional and highly effective drying techniques and monitoring tools to measure your property’s temperature, humidity and moisture content to test, assess, remove and remediate mold.Taking immediate action can make the difference between a small problem and a much larger, costly and more difficult to remedy situation due to mold growth. Make sure your living or work environment is healthy and free of toxic mold, by contacting ServiceMaster of Midland/Orillia for professional mold removal services immediately following any incidences of water damage, or as soon as you see mold or experience unpleasant musty odours in your home or business. Beginning mold assessment and removal procedures as soon as possible will prevent further damage to your property and potential health hazards. Contact ServiceMaster of Midland/Orillia today for professional mold removal services. You can trust our 65 years of experience and expertise in the mold remediation industry. We’re here to help prevent potential health risks and long-term damage to your property due to mold growth. When allowed to grow, mold causes discolouration and damage to building structures and materials. Significant amounts of mold impact indoor air quality, requires specialized remediation techniques and is costly to remove. There are often health risks associated with finding mold in your property, including allergy-like respiratory symptoms, skin irritation, cold and flu symptoms, headaches, nausea and mold-induced asthma. It’s important to know the causes of the mold growth before it occurs, so you can work to avoid damage to both your health and your facility. For molds to grow and reproduce, they need a damp environment and an organic food source, such as cellulose, which is found in many building materials such as wood, drywall, ceiling tiles, and other household materials such as carpeting and fabrics. Mold can also grow in the HVAC system, roof, foundation, and other areas where the environment encourages mold growth.